As part of the Museum Affordances / [Re:]Entanglements project we shall be creating an exhibition. Initially, this will be installed, from October to December 2020, at the Brunei Gallery at SOAS University of London, close to the British Museum. It will then transfer to the University of Cambridge Museum of Archaeology and Anthropology in 2021. We hope to bring together some of Northcote Thomas’s original collections, photographs and sound recordings alongside artworks and research material that we have assembled throughout the project. The exhibition is not, however, intended to be merely a display of ‘research findings’ – it is intended to be a continuation of the research itself. This builds on some of our own and others’ work on the exhibition as a kind of ‘laboratory’ or experimental space. We hope the exhibition will provide an inspiring and provocative forum in which visitors with different perspectives can come together to discuss and debate some of the issues that the project seeks to address. Left: Exhibition Experiments book edited by Sharon Macdonald and Paul Basu; Right: The Light Surgeons’ video installation at The Body Adorned exhibition, The Horniman Museum, 2012. As part of the [Re:]Entanglements exhibition, we are collaborating with the multimedia creative studio The Light Surgeons to make a video installation we are conceptualizing under the title ‘Faces/Voices’. We recently filmed some initial interviews to begin the process of developing this installation. During the four anthropological surveys N. W. Thomas undertook in West Africa between 1909 and 1915, he made thousands of photographs. About half of these were so-called ‘physical type’ portraits – typically taking a full-face and profile portrait photograph of each of his sitters. Such photographs have been much discussed and heavily criticized in academic and postcolonial literature. We are interested, however, in how different people ‘read’ these photographs in different ways. Do they epitomize the ‘anthropological gaze’, turning people into objects to be collected, collated and compared? Can we somehow discern in people’s expressions their inner experience of colonialism? Or do they reveal an intimacy between the anthropologist and the communities that he was working with that points beyond the colonial critique? 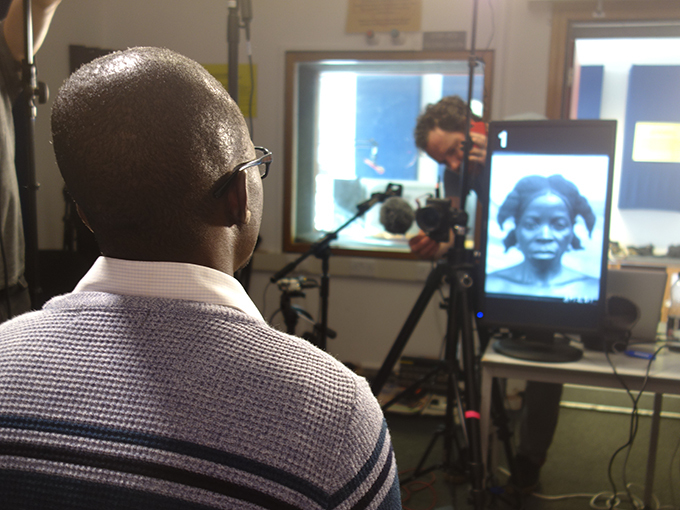 In the Faces/Voices installation we experiment with how faces ‘captured’ in Northcote Thomas’s historical photographs enable contemporary participants to voice their thoughts, opinions and responses to the colonial/anthropological archive. By juxtaposing Thomas’s historical photographic portraits with the faces and voices of project participants and members of the public, we hope to explore the diversity of responses to these images, allowing the different perspectives to co-exist alongside each other. Thomas’s photographic portraits are mute. 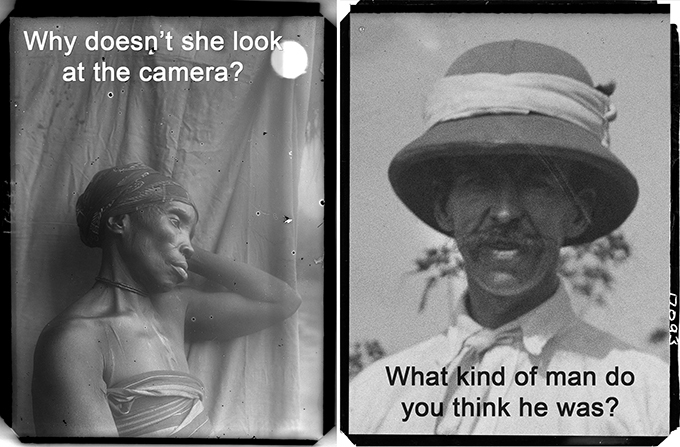 The people he photographed lack ‘voice’ (although we are also experimenting with reuniting Thomas’s historical photographs with his sound recordings – perhaps giving back voice to these images). 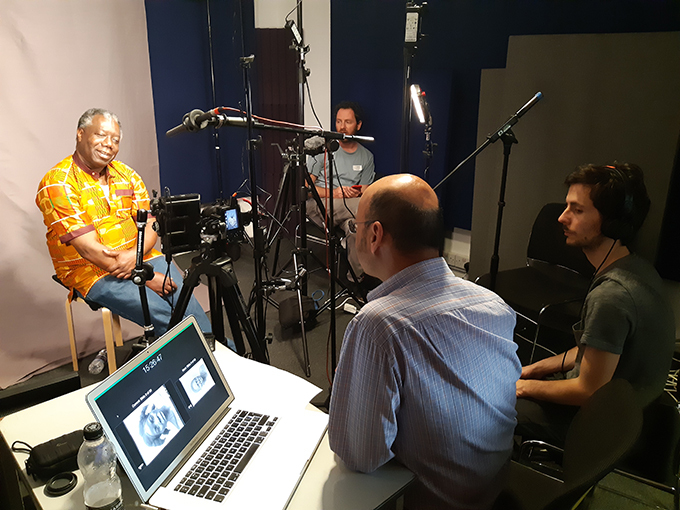 In the pilot video shoot, we began experimenting with how the photographs enable people today who have often very different connections with the areas in which Thomas worked to voice their own positions and responses to the anthropological archive. We’ll be doing more filming in due course. Let us know if you would like to participate!